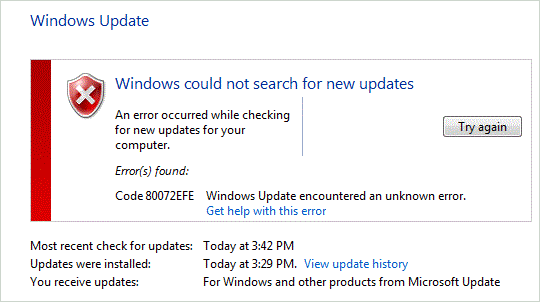 Overview - What is Windows Update Error 80072efe? Windows error 80072efe is a standard Windows error message specifically regarding the Windows update service. Windows update allows you to automatically receive service packs, updates and security patches directly from Microsoft. If you're working on your computer and you see a Windows update error, it means that something is not working right while Windows is automatically trying to update files on your computer. This can manifest itself during download of updates, or during installation of updated files. If any of the above conditions exist, or even a combination of those conditions, it may be impossible for your computer to connect with Microsoft's update servers, and you may receive a Windows Update error 800072efe. Network and Internet Connections - If you're receiving a Windows Update error 80072efe, you firstly need to make sure you have a good connection to the Internet. If you found this page, then the likelihood is your connection is okay. You may want to repair your network connection, which can be done by right clicking on your network connection in Control Panel and selecting "repair". Microsoft Server Issues - There is also the possibility that Microsoft's servers are unavailable. Before making any serious changes to your system, you should probably wait a few hours to see if the error goes away on its own. If you don't receive the error after a while, it was probably because Microsoft's servers were down or unavailable, and the fault has since been rectified. Proxy Servers and Firewalls - You can also receive Windows Update errors if you use a proxy server to connect to the Internet, or if your connection goes through a third-party firewall. Theoretically you can also get connection issues through Windows built-in firewall, but this is usually open to updates by default. The best way to check if a firewall is causing the problem is to turn it off temporarily. Then wait to see if the update problem goes away. If necessary you can do a manual Windows update to test if turning off the firewall worked. The same principal applies to a proxy server. Turn off your proxy server and connect directly to the Internet to see if that solves the problem. Viruses and Malware - Another reason for encountering Windows Update errors is if your computer is infected with a virus or some kind of malicious software malware. If you have tried all the above solutions and you still have difficulty, use an anti-virus program or anti-malware software and do a full scan. Note that in certain cases you will not find viruses but virus damage still exists in your Windows system.